The people of Selma, Alabama know him as the Tin Man. They called his neighbor the Ghost Lady. The Ghost Lady and the Tin Man were known all around town, constant companions who sifted through junk yards together, looking for materials he could use in his art. 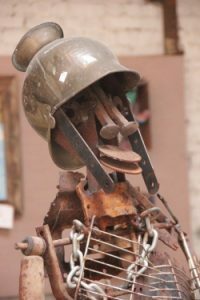 The Tin Man is Charlie Lucas, a well-respected sculptor who works with found objects (mostly junk and scraps), and the Ghost Lady was storytelling’s own Kathryn Tucker Windham, who died in 2011. The two were great friends and neighbors, and their respective art forms influenced one another’s work—Charlie still uses stories to bring his sculptures, many of which are three-dimensional portraits of people and animals, to life. (He also likes hearing the stories of viewers who create tales of their own.) He mostly works with recycled materials, especially tin. That’s where he gets the nickname. Born in Birmingham to a sharecropper, Charlie was one of 14 children. His interest in art started early (he was making dolls, puppets, and other small toys as early as three years old), but there wasn’t much time for play. In a family that large, you have to pull your own weight, and he learned a lot of practical skills as a little kid. He put in a lot of hours at his grandfather’s metalworking shop. Those skills are serving him well now as an artist—but having the time and freedom to really play didn’t come until he was an adult. Now it’s what he does for a living. Charlie’s path to becoming an artist was somewhat unconventional. Felled by a work injury years ago, he knew he needed to find something new to fill his time. He prayed on it, and has been sculpting and welding ever since. (He also paints.) He’s entirely self-taught, assembling everything in his mind’s eye before it comes together on the table in front of him. He had his first exhibit at the High Museum of Art in Atlanta in 1988, and has been a success ever since. Charlie still lives in the same house next door to where Kathryn used to live, though his art has moved on to a bigger space: a large warehouse gallery in downtown Selma. His work attracts buyers from around the country. It tells his story, but it also tells yours.